Situated around the White Mountains range and the famous gorge of Samaria is the picture perfect, unspoilt village of Sfakia. This age old historical village, 72 km southeast of Chania, nestles on the hill slopes overlooking the magnificent natural harbour. The locals earn their living predominately in two areas, fishing in the bay and rearing goats inland, where they produce famous cheeses such as the delicious and famous mizithra and anthotiri. 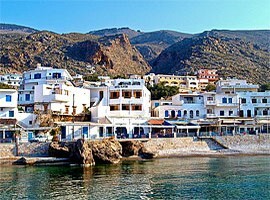 The town centre of Sfakia is a great place to start your journey along the southern coast of Crete. This traditional, calm village slumbers through the morning and wakes up in the afternoon with the arrival of hikers coming in from the gorge of Samaria in small boats. Situated both on the seafront and inside, Chora has some excellent restaurants where the delicious local cuisine can be sampled. Quaint fish taverns and a variety of cafes can be found surrounding the port. The main beach of Sfakia offers excellent swimming facilities. 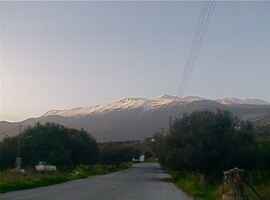 This part of Crete is linked via regular transport with the town of Chania. There are many wonderful mountain and sea excursions to be had in southern Crete and Chora Sfakion which offers a good central base from which to operate. The magnificent plateau of Askifou, the village and gorge of Imbros and the quaint village of Komitades are some fine examples. Many splendid beaches are found in the area surrounding Sfakia. If you are very adventurous, you can hike across Crete by taking the European hiking footpath E4. When you need to rest, you have a choice of quaint hotels, rooms to rent or taverns to enjoy a tasty meal. These establishments offer delicious local foods; you should try the cheese pies, and the sfakianes pies, before having a drink at one of the bars to end your full of joy day. Chora Sfakion also has an interesting history as well as natural beauty. This can be seen when you visit the small Venetian fortress which was built in 1526 as part of a defensive system of towers. This fortress was later occupied by the Turks. Loutro is another small village in this region. The only way to get to Loutro is by boat, sailing into the harbour with the famous lighthouse at its entrance. 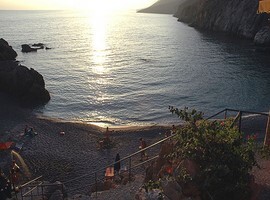 Loutro has many rooms to rent, all overlooking the magnificent bay. Loutro is a secluded paradise, away from the busy, stressful life of the city. The focal point is the beach and the jetty where the boats from Sfakia and Agia Roumeli arrive and depart. A short walk from your hotel takes you to a quaint tavern where you can enjoy a local meal or to the beach for a swim. All you need is a pair of shorts and a t-shirt over your swimsuit. You will find yourself wondering how you will ever leave this peaceful and adorable village. You may want to be lazy and spend the day at the beach swimming and drinking coffee or a cold beer. For the more energetic of you, there is a great opportunity to walk (or canoe) as far as where are the Venetian and Turkish fortress. If lazing is not for you, a 30-minute walk will take you to Phoenix, where you can have a swim in its tiny beach. 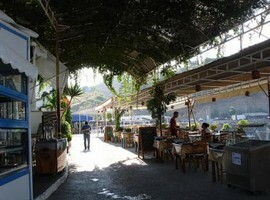 After a cup of coffee, continue and you will come to Marmara and the end of the Aradena Gorge. Marmara is famous for its funny beach umbrellas and its small tavern which serves fresh local fish and traditional dishes. If you are out about 11.00 am, you can take a boat west, to Marmara beach, or east, to Glyka Nera. Spend the day there and return with the boat in the afternoon. For the brave, who don’t suffer from a fear of heights and love the stunning views, there is a wonderful path for walking to Glyka Nera. The trip will take just over an hour. Take the narrow footpath which starts behind the Kri-Kri taverna in Loutro and joins the main road to Sfakia and Anopolis. Glyka Nera (Sweet Water) beach is one of the most beautiful beaches in Crete. The clear blue-green water under the huge cliff is cold and refreshing. The icy mountain water rises in the sea and is clean and safe to drink. The beach doesn’t offer any shade, but umbrellas may be rented at the small canteen, where you can also buy fast food and drinks. Do get an umbrella as sitting under the cliff for shade is dangerous due to the risk of rockfalls. Another point to note – this beach is a popular spot for nudists, so if you have children or won’t feel comfortable with this, it’s much better to avoid this spot. Serious hikers can get a taste of history by taking the upward path from Loutro to Anopoli. The climb takes you 700 metres above the sea level where the most stunning views await you. The church of Agia Ekaterini (St Catherine) and a small Venetian fort await at the end of the path. Take a rest here and enjoy the panoramic view. Looking out across the Sea of Libya, you can see the islands of Gavdos and Gavdopoula, the southernmost border of Europe. After your rest, continue passing the church to the village of Anopoli. A Greek hero, Daskaloyiannis was born here and led a failed rebellion against the Turks in 1770. Daskaloyiannis came to a horrible end by being flayed alive by the Turks in the Cretan city of Heraklion. Once you have reached Anopoli, and if you have enough energy, you can continue to Aradaina, or you can turn back! After crossing the Aradaina gorge, you will find yourself back on Marmara beach. You can then return either by boat or along the coastal path. This route is only for seasoned hikers as it is long and tiring. Still prepared for more? Aradaina gorge offers the highest bungee jump in Greece and the second highest in Europe, a 138 metre plunge off the metal bridge down into the gorge below. This jump is open every Saturday and Sunday during the summer months. Enjoy!